The liquid gold that holds all Italian cooking together. There’s a theory that says cooking with ingredients from the same region will always ensure a harmonious final dish. If that’s the case, it’s little wonder that Italian food just wouldn’t taste the same without olive oil. With a shape and texture for every sauce under the sun, pasta might be HelloFresh HQ’s favourite staple. If attempting to make your own, there are a few key tenets: observe a ration 100g of “00” flour to 1 egg, never add salt to the dough, and when cooking the pasta should have room to ‘swim’ (so, 1 litre to 100g pasta) and be very well salted (though not quite as much as the sea). I must confess that when someone starts their dinner without at least one clove of garlic, I feel very confused. That is because garlic is delicious and infuses everything it touches with a flavour so divine I can’t believe it’s still legal in NSW. Please, please please respect the Italians and never used jarred garlic. The chemicals in alliums like garlic are released and degraded when the cloves are broken down, so they just won’t have the right flavour after being stored in a glass jar. The reason for the red on the Italian flag, the beating heart of Bella Italia, the start and finish of every great pizza or spaghetti dish; Italian cooking wouldn’t be Italian without tomatoes! There’s no shame in using the tinned variety (the Italians use them all throughout winter), and be sure to explore all the beautiful seasonal and local varieties available. Known as the ‘king of herbs”, no Caprese salad, Margherita pizza or Panzanella would be complete without the robust soft leaves of basil. Especially at home amongst garlic, tomato and lemon, it’s probably one of most iconic of Italian ingredients. This one can be a little controversial. Some people are turned off by the hyper fishy, excessively salty profile of anchovies. We get it – a load of them on a pizza can be a bit overwhelming. But when one is stirred into some garlic and olive oil as the base of a pasta sauce? A miraculous savoury depth emerges that is really second to none. If basil is the king of herbs, basking in the summer sunshine of Tuscany, then rosemary is his queen, presiding over winter with a gentle, warming aromatic gaze. While basil is perfect for salads, quickly woodfired pizzas or speedy pasta, rosemary holds it’s own in a slow-cooked porchetta or silky mushroom risotto. The part of the caper bush we eat is actually the flower buds. Preserved in brine or on salt, they’re perfect for a salty hit like anchovies, in salads and pasta. A mild, creamy cheese made from sheep, cow, goat or water buffalo milk, ricotta is perfect when adding creaminess to savoury dishes, and just divine in desserts or pancakes. The hard cheese is protected destination of origin, which is why its name gets a fancy capital letter. Find this yellow pyramid lending its definitive flavour to pasta, risotto, soups, stews, polenta and just about anything worth eating. Zested, juiced, preserved, baked – lemon gets a serious workout in Italian cuisine. Use it to cut through richness, to form a beautiful simple vinaigrette with extra virgin olive oil, or to finish off a perfect pasta. Polenta is maize or cornmeal product, served as a hot porridge side or allowed to cool and then baked, fried or grilled. The key to a really good polenta is leaning into its thirstiness and not forgetting seasoning. Cook it with stock, a little milk, and plenty of Parmesan, salt and pepper. Fact: if the Italians do it it’s got to be good for you. To be truly authentic, don’t bother with ‘cooking’ wine. The Italians don’t believe in cooking with any drop that isn’t fit to drink, so double up and get a decent bottle for yourself and your pot. A strong, nutty mushroom, porcini is perfect for adding a ‘meaty’ character to vegetarian dishes, and creating a rich flavour profile wherever it goes. Porcini literally means ‘piglets’ in Italian as well, which I love. The fungus, with a very thick stem, can be found fresh or dried. Revive dried mushrooms in some hot water or stock before popping into a soup, stew, polenta or rice dish. We really have saved the best till last here. Arguably the most popular of the dry-cured ham products from Italy, finely sliced prosciutto is the beautiful salty product of sometimes years of ageing pig or wild boar leg. It’s wonderful in antipasti, on pizza and pasta (of course). The only time we’ll advise against it is when making Roman carbonara. In that case, use guanciale (cured pork jowl or cheeks), egg yolks, Pecorino, and never ever ever cream. 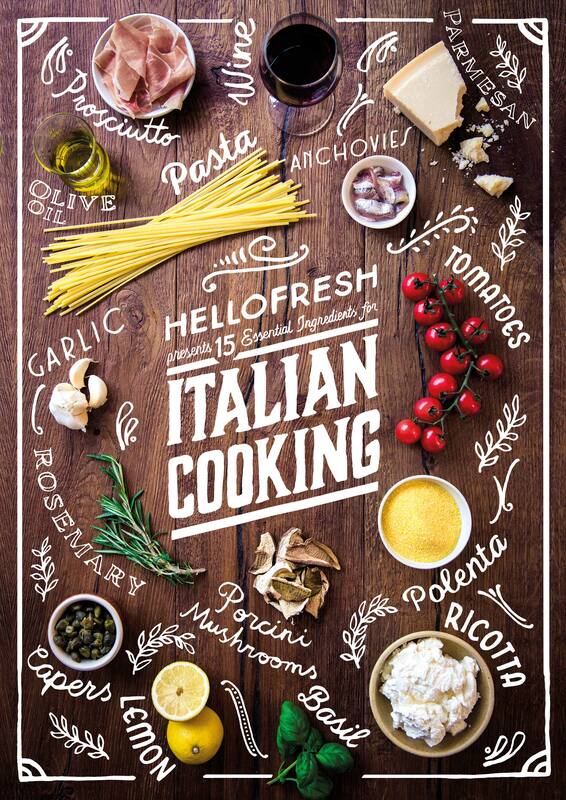 If you are looking for a delicious and easy carbonara recipe, check out this HelloFresh customer favourite! …And there you have it! Go forth, safe in the knowledge that you’ve got the essentials ingredients for Italian cooking covered.